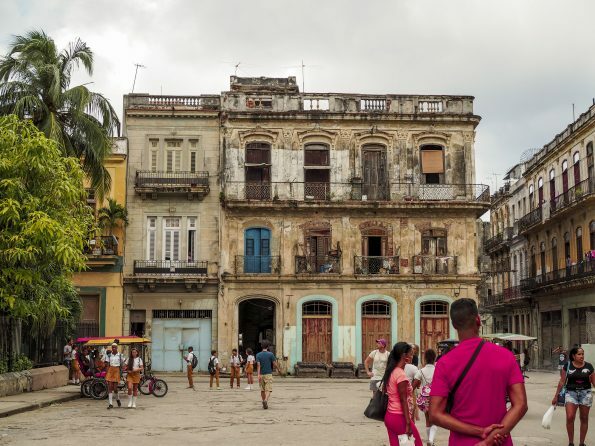 Cuba can be best described as a big culture shock! It is a beautiful, interesting, yet challenging country. I recommend reading about the history of Cuba before you set off in order to fully appreciate and understand the culture. It is a poor country in terms of material goods, yet it is culturally rich. Admittedly we were a bit nervous going on our trip. We heard lots of off-putting things such as the food will make you sick, there’s no fresh water, you’ll be scammed with your money and the lack of internet will mean you will have no access to the rest of the world. The biggest worry for us was travelling from America. “Cubans hate Americans, they don’t like people coming from there.”- we heard over and over again. Well, we really needn’t have worried so much. We ate like queens our whole stay, bottles of water were easy to buy, and although the wifi wasn’t free, we managed to go online when we needed to. We did a lot of research on the different currencies and how much things should cost (more on this below) so I think we avoided scams for the most part! In the end, we decided to fly to Cuba via Mexico, looking back we think we probably would have been fine to fly direct from New York. There were other American flights arriving into Havana when we did and the people from those flights didn’t seem to have much hassle at immigration. Our trip to Cuba was a last minute unexpected decision. We decided to go for one week and although we managed to fit a lot in you could easily go for two weeks, or even three. 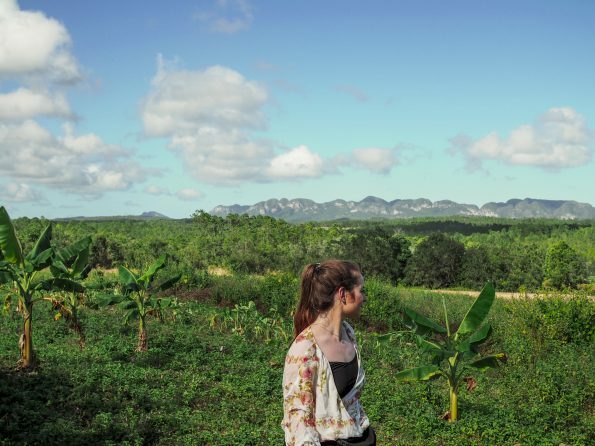 We explored just two of the main areas of Cuba, Havana andViñales. Many people who visit Cuba will also travel up to Trinidad, Varadero, and other parts depending on how long they stay. 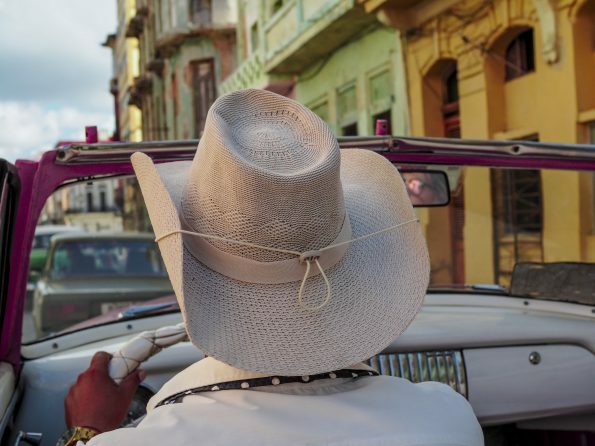 We spent three nights in Havana before taking the three-hour drive up to Viñales. 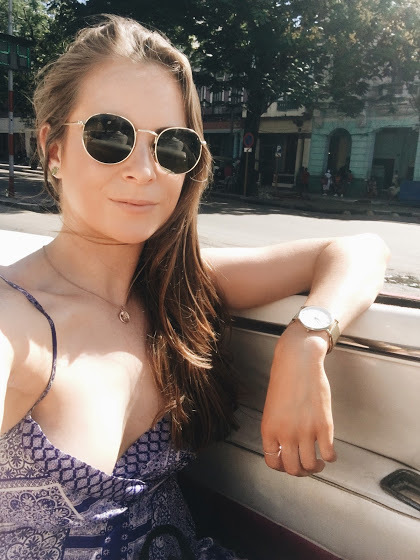 Although there is plenty to see in Havana, we found we fit most of it within two days, so if you’re trying to see a few areas of Cuba, I wouldn’t feel the need to spend too long in Havana. Two full days is plenty of time to see everything like the museums, famous Hemingway bars and take the vintage car tour. We visited in December which is during Cubas winter, it was still very warm during the day although at night we did need sweaters. It seems like a nice time of year to visit, as it gets very hot in the summer. It’s more than likely that you will arrive at Havana airport. It was here that we transferred our money into CUC. CUC is the Cuban currency for tourists and is essentially they’re way of ripping us off. However, it really is still incredibly cheap for tourists and you typically won’t need to deal with the local currency. Cash is king. You will not be able to pay with cards anywhere. There are ATMs but they seem to often be broken or the banks might randomly close. I recommend having cash with you when you land and exchanging it all in the airport. If you are coming from America try to exchange your money into a different currency like the euro as you will be charged 10% if you try to get CUC with dollars. 1 CUC is the equivalent to $1 USA, meaning it is easy to understand how much everything costs. 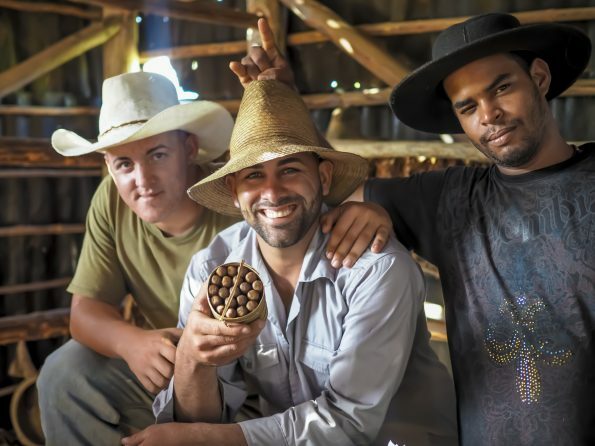 Horseback riding tour – Approx $30 for a 5 hour trip with coffee, rum and cigar tasting. The fabulous view from our casa. The two main choices you have are casa particulars or state-owned hotels. My preference would have to be casas particulares in order to really experience the Cuban life.We booked both our casas in advance on Airbnb. 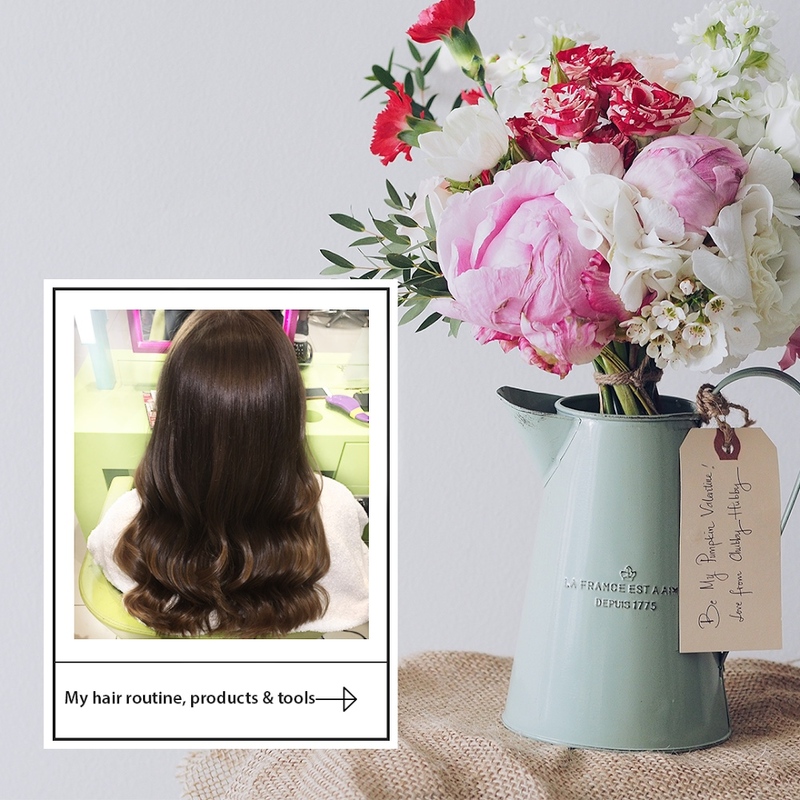 They are clean, the service is spot on, and they are considerably cheaper. We absolutely adored ours! Most of the casas will help you with information and advice and, arrange transportation. We found most Cubans had good English, however, our Casa lady in Vinales had none so we wish we had downloaded a translator app in advance! 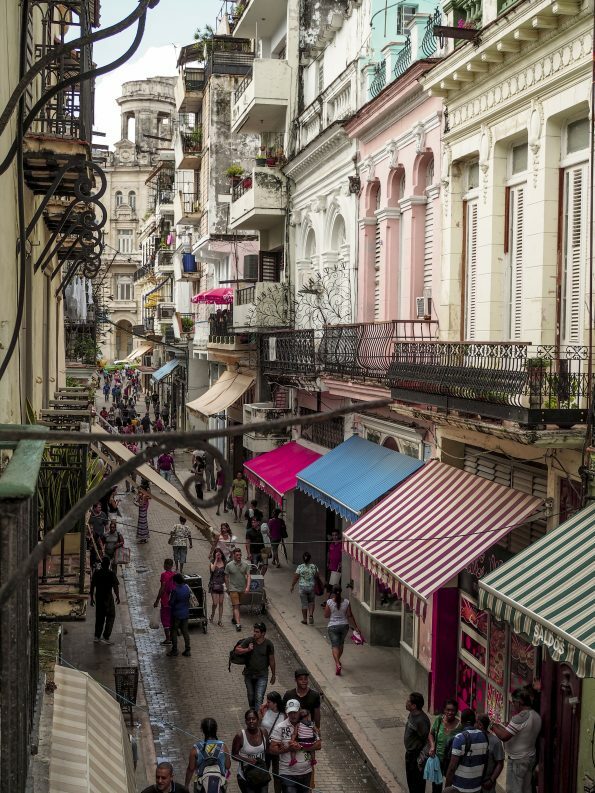 The best thing you can do in Havana is simply walk up and down the different streets. It’s hard to describe how old crumbling buildings can be so beautiful. This cost us $40 for three people. It’s possible we could have bargained with the driver but we weren’t sure how much it should cost. Make sure you chat with the different drivers to see which one has the best English so you can understand them when they are telling you all the history during the tour. The vintage cars and their drivers are ready and waiting for you up and down the main streets. You’ll have no problem finding one. Our vintage car, with the mafia hotel in the background. On our third day in Havana, we felt we had already completed everything on our to-do list and struggled to think of a way to fill the day. We decided to take a taxi to the National Hotel and spend a few hours by their pool. Non-guests can pay $25 which includes $20 credit for food and drinks. The hotel is really interesting and has a lot of history. It is where most important or famous guests stay when they come to Cuba. The Mafia stayed here and there is a museum about their history. Fábrica de Arte: This place is unlike anywhere I have been before. It is an old oil factory turned into a nightclub, art gallery, cinema and more all in one. Dance in the nightclub, watch a performance, walk around the different galleries and exhibitions, watch movies, grab food, a coffee or a cocktail. You will be given a card when you enter which is stamped everytime you purchase something meaning you pay for everything at the end before exiting. It is a must see for a night out in Havana and there really is something for everyone. Good Bars in Havana are not hard to find, but Ernest Hemingway had three favourites while he was living in Cuba and today they are a must-see for tourists. Yes, they are very busy and also more expensive than regular bars but it would be a shame to come to Cuba without giving them a visit! 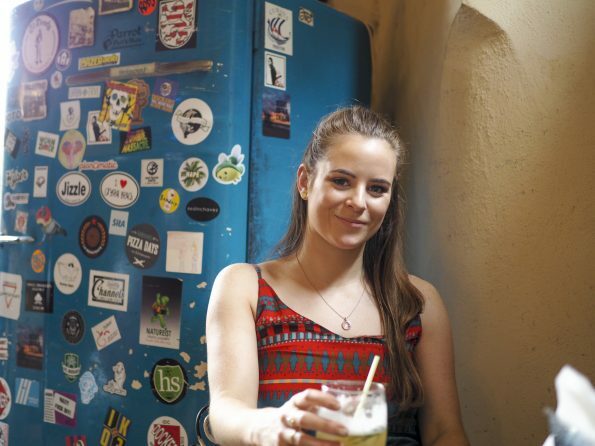 They are Floridita, La Bodeguita del Medio and Dos Hermanos and are all in the centre of Havana. Floridita seems the most popular and is really beautiful both on the inside and outside. We ate in La Bodeguita del Medio were both the food and drinks were incredible. There was a long wait for a table but worth it! I had the best daiquiris and mojitos of my life in these bars! We were worried going to Cuba that the food would be bad and may make us sick. But we managed to find great food every day! Very few places are open for breakfast but luckily our casa provided a lovely breakfast and on the morning when she was unable to make it we went to Cafe Dandy for omelettes. We loved Cafe Dandy and also had lunch there another day. I’m going to do a full post on food in Cuba coming soon! 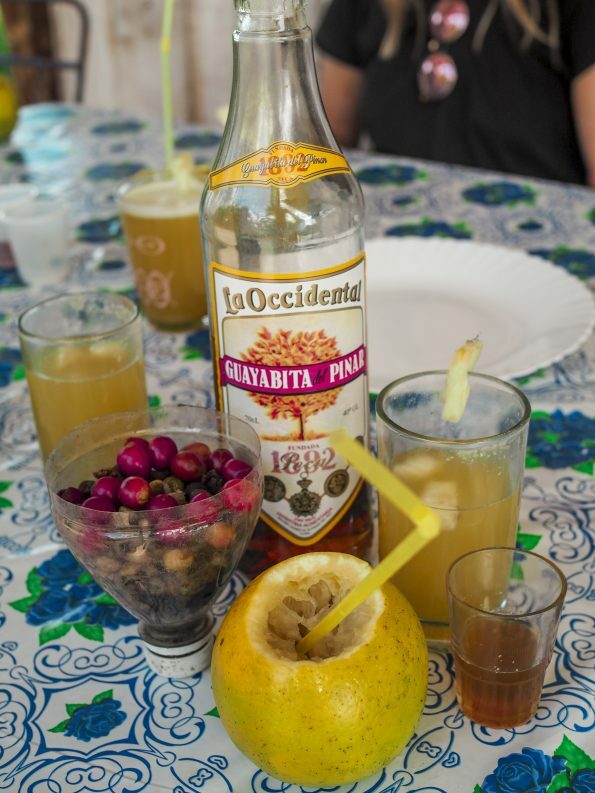 Some of our favourite restaurants included La Guardia, O Riley 304 and El Trofeo. The view from our Viñales casa! The hill we had to climb up to our casa, the view was worth it! 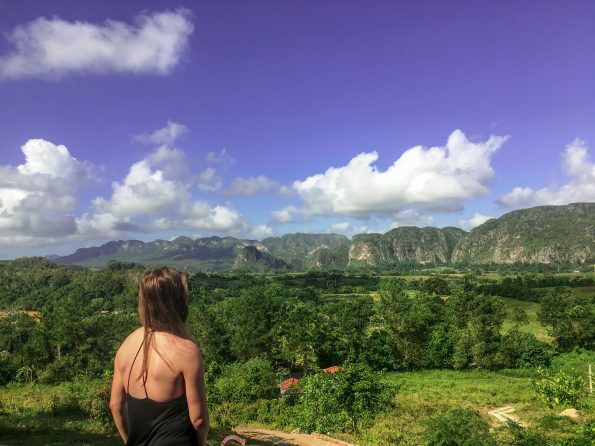 The Viñales Valley has been listed as a UNESCO World Heritage Site and it is easy to see why! Our casa was up a big hill (a funny experience to get up to with all our bags!) with the most amazing view of the valley. It wasn’t the best walk to and from the town as there isn’t much of a footpath and no lights at night, but taking a taxi home was very inexpensive. 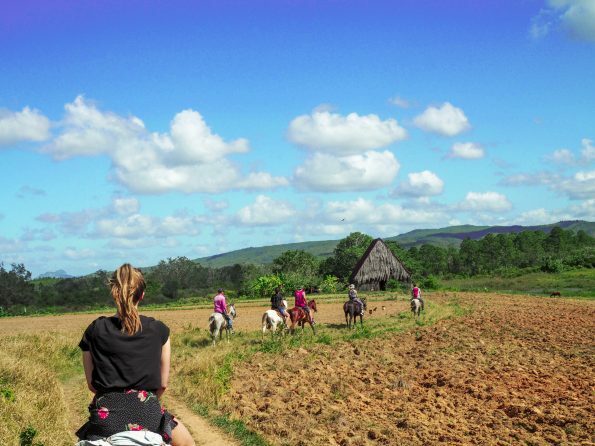 A horseback riding tour is an absolute must in Viñales! It was the highlight of our trip. The tour was organised by our casa and lasted about five hours. The horses arrived at our casa and off we went through beautiful fields and forests stopping off at a rum and coffee plantation and a cigar farm. We sipped on the freshest Mojitos you will ever taste, made with sugar we watched them squeeze from a sugar cane! We also tried our hands at smoking cigars, which shockingly tasted far more pleasant than I expected as they were dipped into fresh honey first, yum! The town of Viñales is very cute and enjoyable to walk through with colourful colonial-era wooden houses. There are lots of nice places to eat and bars. The village has a tourist information centre where you can book different day trips. 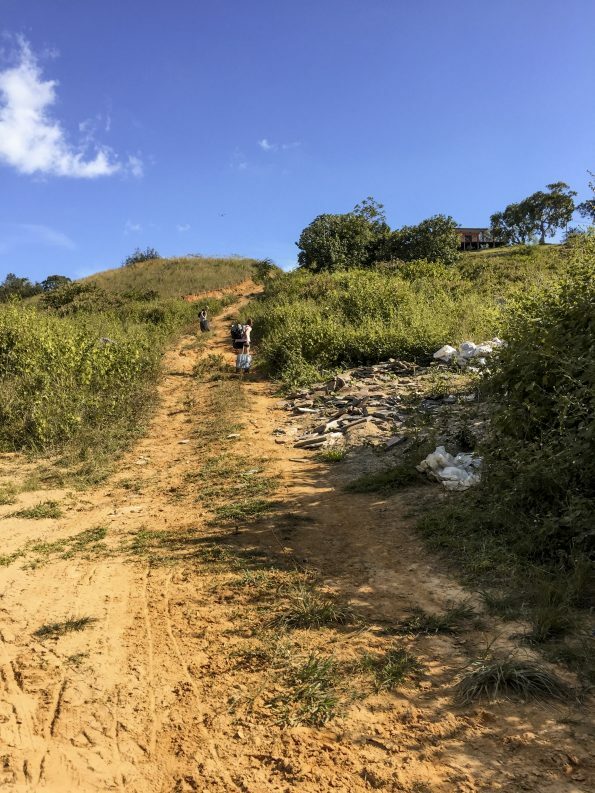 We were only in Viñales for two days so we didn’t do a second trip but it is possible to visit the beach of Varadero and a cave tour from here which we would have liked to do if we had the time. 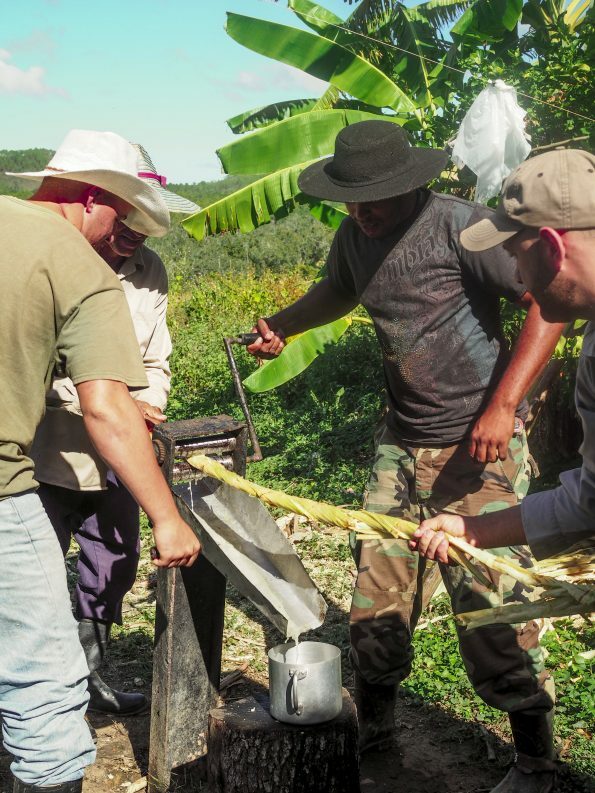 Squeezing the sugar from a sugar cane for our Mojitos! Cuba is like stepping back in time. It’s common knowledge that Cuba has limited wifi. We still expected for hotels and certain places to have it but they really don’t. I never did learn how so many businesses manage without it. The only way to gain access to the online world is by buying ETECSA WiFi cards. One wifi card will give you one hour of internet. They are approximately $5 each but we sometimes we’re able to get three for $10. In Havana, we got ours at the Hotel Inglaterra where a lady sells them. Ask the hotel doorman to point you in the right direction. In Viñales there is ETECSA WiFi telecommunications centre where you can buy the cards and sit nearby at the square near the church. You will see everyone there on their phones! One extremely disappointing feature of Cuba is the Men and how they treat women. As a group of three girls, we never went more than 30 seconds without a catcall. From the moment you step foot outside it is relentless. They will hiss at you, make kissy noises and say unpleasant things. It can really get to you but we understood that this is just a very underdeveloped country where this is seen as normal and we were told the Cuban women actually like it! This is obviously very different for us but it’s best to ignore them and walk away. I don’t want to say don’t go as a group of girls, but just be prepared if you do. I think to have a male with you would certainly detract this attention. I would certainly never recommend women go to Cuba alone. Something that people may not know is that you need a Visa to go to Cuba. I got mine in the airport before my flight for about €25 but you can probably also purchase them in advance in a travel agency. The visa is a simple paper card. When you arrive in Cuba, immigration will take one half and then when you leave, they take the other so make sure not to lose it! 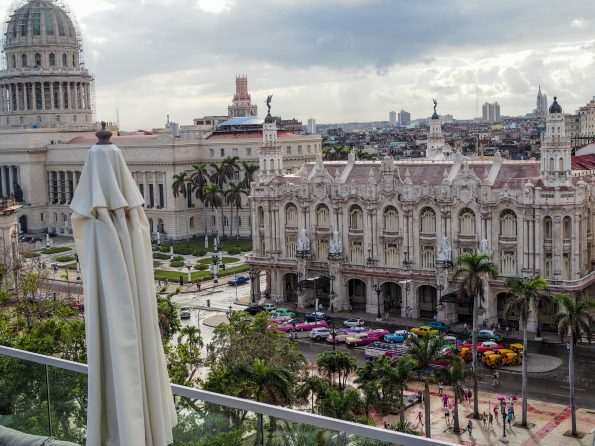 The capital and largest city of Cuba is Havana or “La Habana” in Spanish. Cuba has a population of over 11 million people. Cuba has 9 sites on the UNESCO World Heritage list. 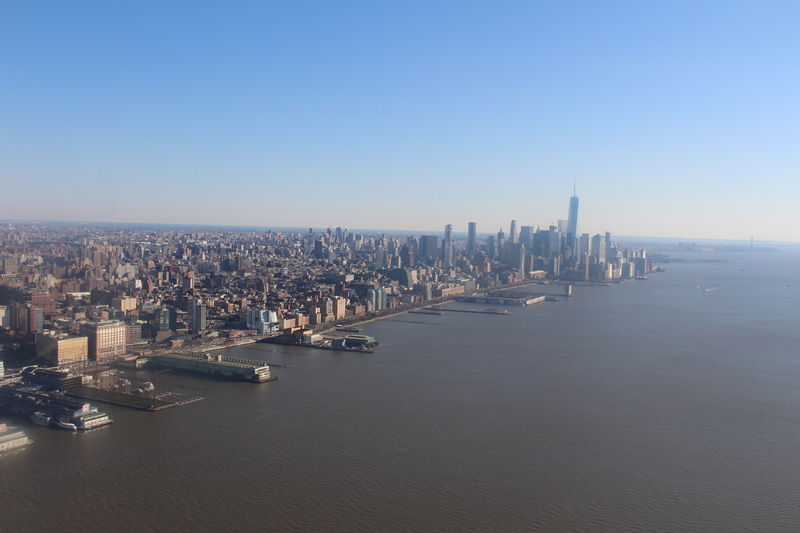 In 1492, Christopher Columbus arrived on the island and claimed it as a Spanish territory. Cuba remained a Spanish colony until the Spanish-American War of 1898 when the country became part of the United States. This was only brief though, the country was given independence in 1902. The United States had a strong influence on the island until 1959. The country remains one of the world’s four self-declared communist states today. Most of Cuba’s labor force is controlled and employed by the state. Until 2011, an import ban in the country meant that the only cars found on the roads were classic cars from pre-1959. Since 2011, the ban has gradually been lifted to allow more modern vehicles on the roads. Until 2008, Cubans were not allowed to own cell phones. Cuba has two different currencies: One type is used by natives, while tourists use the other currency. 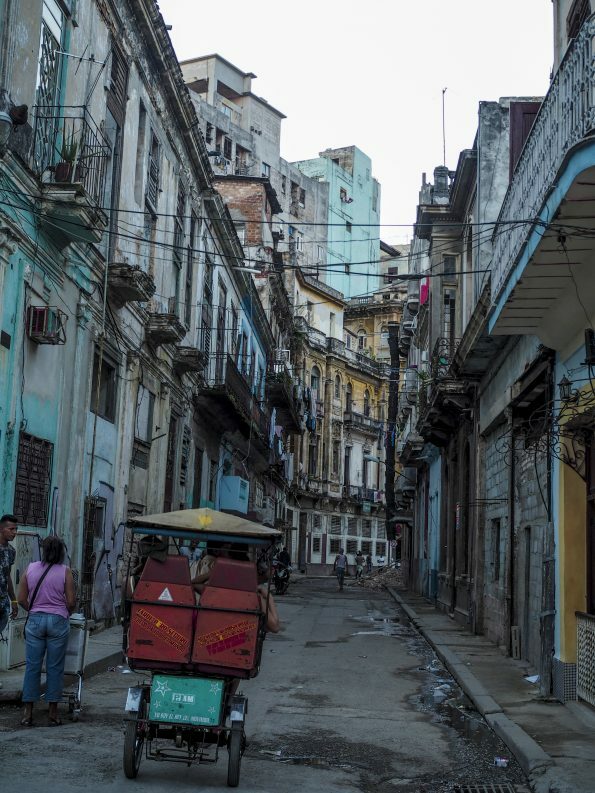 The average salary in Cuba according to data from 2013 was about $20 per month. The Cuban government owns and controls all broadcast media, including the country’s radio and TV networks. 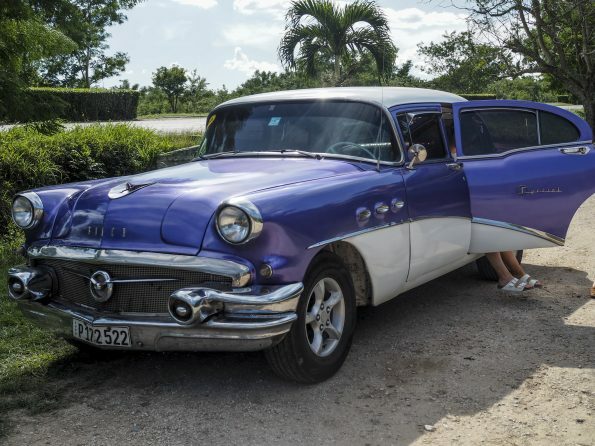 The car we drove in for three hours between Havana and Vinales. There is so much to explore and discover in Cuba and endless photo opportunities. It really is the type of place you need to see for yourself. If your thinking about going to Cuba GO NOW! Things are slowly starting to change in the country which is evident by some new modern hotels popping up. Many believe that in just ten years time it will look very different. The American embargo has been lifted meaning it is only a matter of time before a Starbucks opens up! This country is unlike anywhere you have seen before and an absolute must for your travel bucket list! If you have any questions, please, drop ’em in the comment below! These are such beautiful photos! 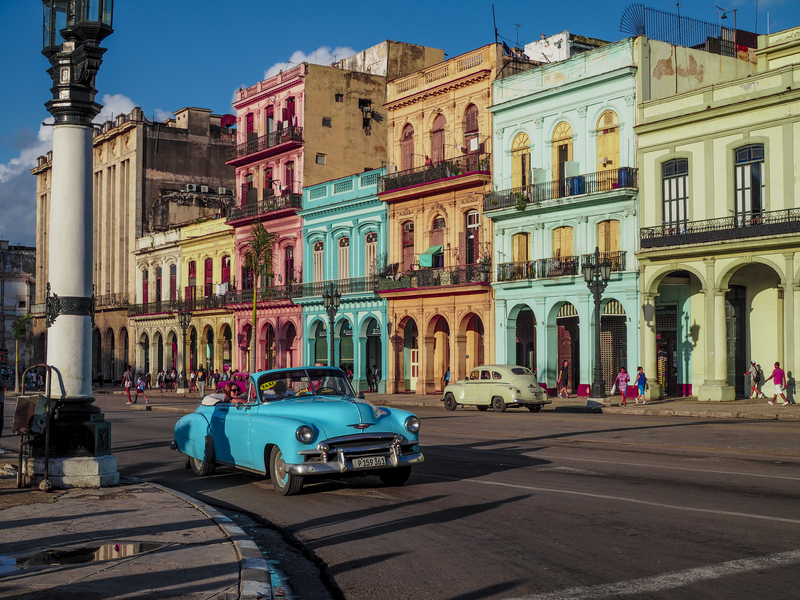 I’d love to visit Cuba one day, so thanks for this post! I’ve actually been wanting to visit Cuba lately! These are all great tips! This looks like the trip of a lifetime! I can’t get over the beautiful architecture there. The second I saw the word Havana that song on the radio started playing in my head! Looks like a fun time! Wow, it’s so affordable there. I think I may want to visit — it’s so pretty! Ohmygosh I have ALWAYS wanted to go to Cuba! You’re so lucky you got to go! These photos are a dream and everything is so inexpensive! It sure is a beautiful place! Sounds like a fun trip! Cuba is definitely on my travel bucket list. It looks so lovely. What a gorgeous place! I’d love to do the car tour! So beautiful! I so want to go to Cuba! Oh my goodness. I want to gooooo! This sounds like such a fun last-minute trip. I’m glad you got to fit so much in. How exciting! And it sounds like it’s a pretty affordable country to visit too! Culturally rich is the best way to describe somewhere like Cuba!! I want to go there SO badly, it’s on my list and while it does seem a bit scary (although I don’t think that’s really the right word…) it has so much history and I definitely want to get there! Great photos. And so nice that the currency transfers so easily. I usually spend so much of a trip just trying to figure out how much everything will be in dollars! this is on my list, gorgeou views! I’m saving this for our trip!